Here we go again. 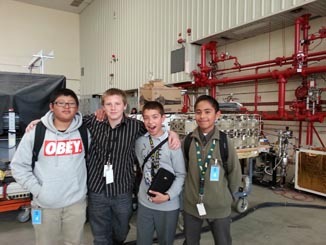 Afterfinished the pre-flight and the science meeting we are ready to go airborne onemore time. 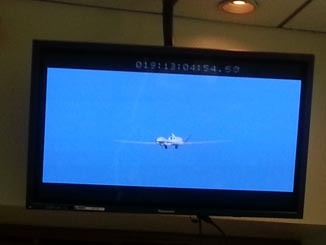 On Feb 26 at 9:59 am(PST) the Global Hawk 672 took off from Edwards Air Force base heading south toHawaii. I’msure you are wondering why we fly to this area so often. Well, our brilliantgroup of meteorologists and modelers always keep an eye on the weatherconditions and try to find the perfect locations to fulfill the objective ofour missions. For this flight, this area was characterized by the presence ofanticyclonic circulation, very cold air, considerable condensed water, and lowwater vapor concentrations. 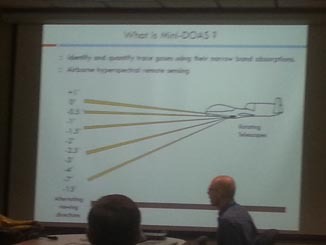 So, from our scientific point of view, this was anexciting flight. On the other hand, theflight kept me busy most of the time. 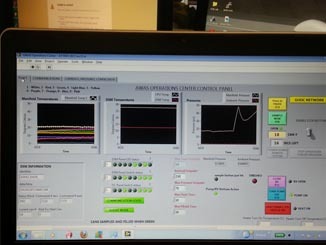 Once again, we performed nine verticalsprofile which forced us to power up and power down the instrument severaltimes. Besides, the absence of one of our satellite bands, made the samplingstrategy a little bit complicated. There were a lot of delays for gettingconfirmation of the commands we sent. However, one of the most exciting partswas to execute two of these vertical profiles near to the area where anothergroup was performing balloon measurements. Comparisons between our measurementsand the ones obtained by this group will be extremely helpful, not only for usbut also for all the scientific community interested on knowing the behavior ofozone and water vapor along the different layers of the atmosphere. Our ATTREX 2013 lastflight I have a bittersweet feeling and a strangesensation which is hard to explain. I’m excited to complete our mission, but atthe same time it is sad for me to perform my last flight. I know I will be doit again in a blink of an eye, but believe me, with my lack of sleep it is hardto control my emotions. 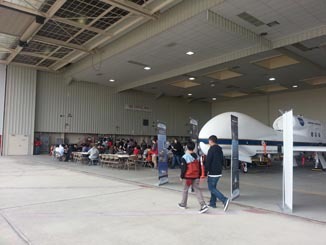 So, here we are again (and for the last time), on March1 around 6:15 am (PST) the Global Hawk 672 took off from Edwards Air Force Baseheading south of the equator and along the continental line. 24 hours ofexcitement, particularly in the southern part of the leg where we found a hugecloud which allowed us to take a lot of measurements. Without a doubt, one ofthe most entertaining flights! 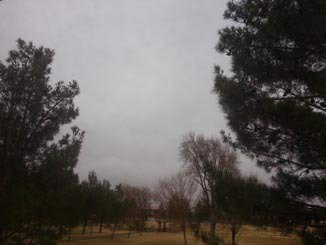 I collected a great amount of samples aroundthis cloud. At some point, I was even worried because I thought I would use allmy canisters here and I would not have anything else for our way back. 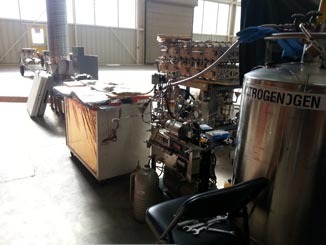 However,the science mission crew was aware of the number of canisters left and workedwith us to maximize the their use. By the end of theflight, just before landing, I noticed that many of us were exhausted. We didfeel the satisfaction of completing our last flight and the whole ATTREX 2013campaign was a success! We weresurrounded by the most amazing crew of pilots, managers, scientists andmodelers. Next step, remove theinstruments for the aircraft, pack our supplies and go home! Day60: GOOD BYE ATTREX 2013! Wow! My two months ofadventures have come to an end. Everyone packed and one by one have left thehangar. Yes, the place that I used to call “my office” for the last monthslooks empty, but it feels full; full of happy memories, funny moments and somefrustrations. It is hard to say goodbye, but for all us it is more like a SEE YOU LATER…we will back in a couple ofmonths to continue our mission. I’m sure ATTREX 2014 will be even better. Thus, I don’t want tofinish my blog without saying THANK YOU! Yes THANK YOU to ALL my ATTREX team.We made it! You guys are the most incredible, fascinating and enthusiasticteam. It is an honor for me to be part of you, and I could not feel more proud.Let’s continue with our hard work (I know it is extremely HARD) but it is worthit. I can’t wait to see youagain to discuss the results of our measurements, and to prepare our nextcampaign in the beautiful area of GUAM. 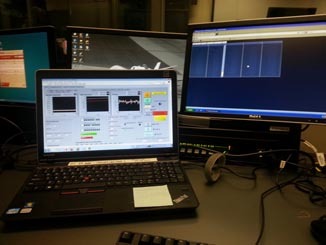 After a very nice breakwe are ready to keep working and preparing our instrument for our fourthscience flight. Once I finished our pre-flight, I needed to figure out ourflight plan for sampling. This plan is based on the information provided by ourscience team, who look at the weather conditions prior to each flight. Lookingat the flight path provided by the science team I thought about how much fun Iwould have on this flight. They planned 13 consecutives vertical profiles (ordives) which would mean to turn off GWAS before each descent. It was alsochallenging to plan how many samples we should collect during every ascent. So,after a couple of hours I came out with a good plan: collect 5 to 6 samplesduring ascent and just a few (3 to 4) at cruise altitude. In this way we couldhave a better look at the chemical composition of the vertical structure of ouratmosphere. 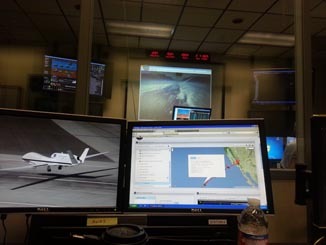 So, here we are,February 21th around 6:47 am (PST) the Global Hawk 672 took off fromEdwards Air Force Base heading to south of the equator for the second time. I’mnot going to lie, I was still nervous about the behavior of GWAS, but after ourfirst dive and noticed how GWAS recovered from its first power down, I feltmore relaxed. Besides, this time I took the later shift (from midnight untilthe aircraft landed) so I did not have to deal with the communication lostissues and the blind sampling strategy. 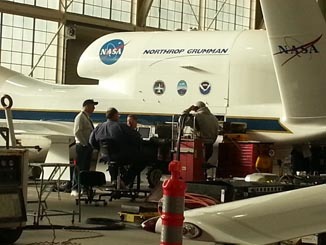 After 24.5 hours offlight the Global Hawk finally landed. Three hours later we were able to takethe canister out, collect the data from the aircraft computer and put the newset of canister to have them ready for pre-flight. Yes, two flights down,two more to go! 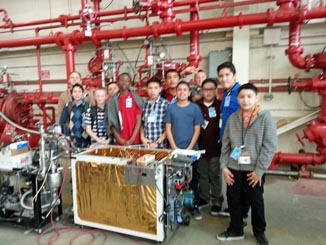 Today, we hosted anevent for 99 Middle School students from the Palmdale AerospaceAcademy. Without a doubt,another of my FAVORITE experiences. How fun it was to explain to these kids howmy instrument works. It was not that easy, because I think I am used to using atechnical vocabulary for this, but I finally found the right words and Ibelieved they got the idea. 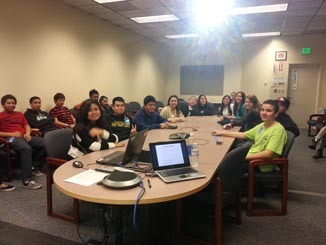 Even though they still have time to figure out whatcareer path to follow, many of them already know what they want to be. This isreally encouraging for our scientific community. 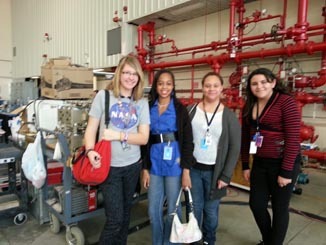 It is nice to know that futuregenerations are already attracted by science. I wish them the best for theirfuture. Keep working hard kids. Remember that society makes progress by havinga skilled and creative work force. Thanks for coming to Dryden. Today was the day!!! Wefinally performed our Combine System Test. In general, the test ran smoothly,and everything went as I expected. However, I have to confess, I could not helpbut feel anxious the entire time. I am not sure why. I have been doing pre-CST,and bench test for almost a month, but I believe every time is different. Today, I was lucky tocount with the assistant of one of our engineers (Roger). He kept an eye on allmy movements, so I felt a little bit more confident, but still, I think anxietywon the battle. Once the test finished,I finally could relax and have some fun! I was waiting to see the results fromthe computers. We usually can take a look at the data from our ground computerat any time, but sometimes, it is better to see the results from the aircraftcomputer (you know, if satellite communication fails, the aircraft computerstill contains most of the data). I cannot complain; the results from the testwere good. We were able to send commands from the ground and our instrumentexecuted them perfectly. We tested the heaters and the pumps. We did not takeany sample since we were on the ground. But we are confident that if theheaters and pumps worked, the canisters valves will also work! Let’s just wait and see what will happenduring our Range flight! 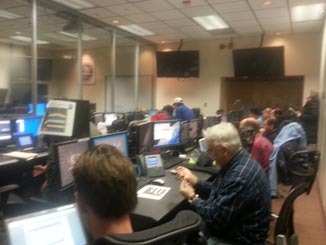 ATTREXteam at the Global Hawk Operation Center during CST. 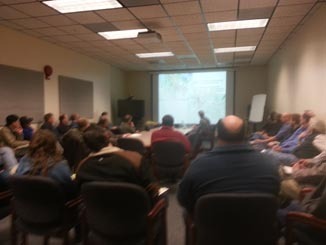 Roger (front row 3rdsit from left to right) keeping an eye on AWAS computer during CST. 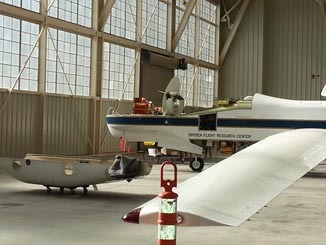 Rogergetting ready to collect the CST data from our instrument computer inside theaircraft. I’m so excited;tomorrow will be our first time in the air. So, today we checked our instrumentone more time. 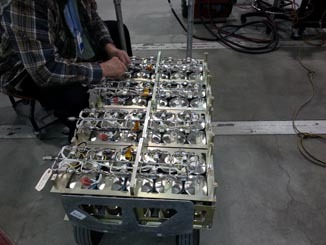 In our pre-flight, wecheck all bolts and electrical connections in our instrument (of course, wedon’t want the instrument to jump around during the flight). 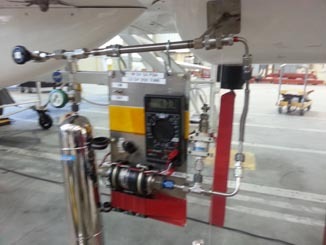 We also set up the instrument computer insidethe aircraft, and pump the inlet to verify that there are not leaks. The procedure takes like 45 min. Rich and Roger werewith me during the pre-flight (I believe six eyes are better than two). Ipersonally can’t wait for tomorrow’s Range flight. It would be a short flight (5 or 6 hours),but it will be the opportunity that I was waiting for. I will finally collectsome samples!!! 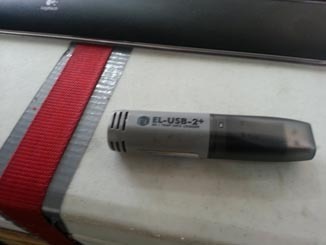 Our “home made” device to check the inletduring Pre-flight. Day16th: Range flight…but wait, not so fast!! Today I woke up around3:40am to be ready to pick up Roger at 4:40 am (we had to be at the Global Hawkoperation Center at 5:00 am) Flight was scheduled to take off at 7:00 am. Once we got to the Global Hawk we noticedsomething strange…not all the pilots were in the Flight Operation room, andthrough the screen, we just saw one person around the aircraft (there are usuallya lot of people around preparing the Global Hawk for takeoff) Thus, 5 min afterI set up my ground computer, one of the network engineers broke the news: FLIGHIS CANCELLED!…Whaaaaatttt???? But I was so ready for this flight (Bummeragain!!! ), Well, it seem like the aircraft power pallet was not working and wecould not fly without that data information. 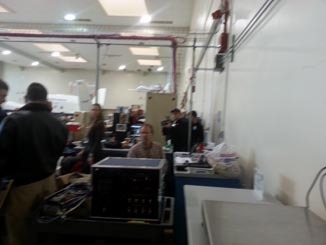 Thus, the plan will be to fix thedevice and proceed with our Range flight tomorrow (same time, same place). 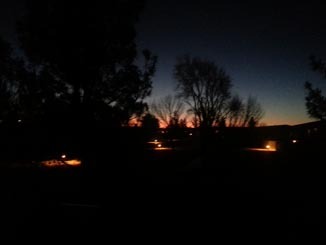 As Jochen (a member ofthe Mini Doas group) said: “It was a good drill”…ohh yes indeed!…now I knowhow terrible will be to wake up again at 3:00 am…but hey!, let’s look at the bright side…did I mention howbeautiful the sunrise is at Dryden? Hereare some pics…enjoy while I go back to sleep. Well, here we areagain! Range Flight Day!…not too excited as I was yesterday, but ready to goONE MORE TIME. Hopefully we will be in the air tomorrowmorning. You know, third time’s the charm. 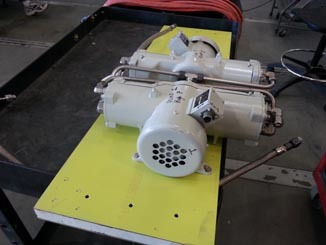 Mechanicsfrom Northrop Grumman testing the power pallet. Finally, Range FlightDay!…More than excited, I just felt like I have to get this done. We havebeen trying to fly for three days, so it was time for me to get some airsamples. While the aircraft wastaxiing, I started to feel really anxious. I was wondering if I did mypre-flight correctly. I was sure I did, but I could not help to have my doubts(I think it is normal when you feel so nervous). By the time we requested topower up our zone I decided to get rid of my fear and focus on my work. Yes,after we powered up the instrument, we started to get our “packets” through thesatellite; uffff… what a relief! I took my first sampleapproximately 15 min after takeoff. Ifelt really glad when I saw the plots on my computer and I noticed that Iactually drew some air into my canisters. Since the flight wasreally short (5 hours) I had to take samples every 3 minutes in order tocollect the 90 samples that we usually collect during a science flight.However, during this flight, we also performed a power test, since the GlobalHawk managers needed to know the power consumption of each instrument. Thus, inthe middle of the flight, they decided to power down each of the aircraft zonesand take a look of the changes on currents. Unfortunately for us, ourinstrument is the one that consumes most of the power…this mean, that forsecurity issues with the aircraft, we will have to turn off AWAS every time theaircraft descends. To be honest, my team is a little concerned about it. 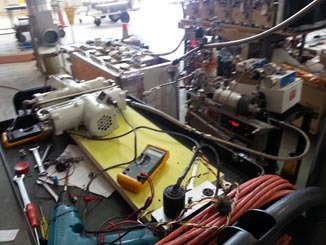 Westill do not know how the instrument will behave with this sequential powerdown and ups. But we will figure it out in our next flight…so stay tuned. AWASground computer during sampling. See how the pressure changes (white line onthe 3rd plot from left to right) as the canister drew air. And now its time to seewhat I got! One of the first thingswe do after each flight is to extract the data from the aircraft (part of ourpost-flight procedure). From the values collected by the aircraft computer Iverify if all canisters open and collect sample. However, there is a lot ofinformation that I need to gather from the data e.g. where the samples werecollected, how long it took to the canisters to fill up, what pressure eachcanister reached during sampling, etc. So I spend the next couple of dayslooking at the numbers and plotting the results. 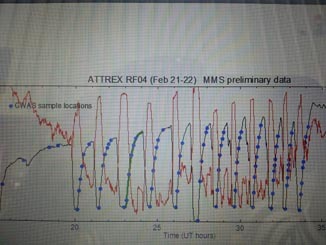 During my preliminarydata analysis, I found out we missed one of the most important “packets”, theIWG1 (a text file that record aircraft information such as altitude, longitude,latitude, etc) , thus I also spend a lot of time exchanging e-mails with oursoftware engineer in order to solve this problem before our next flight. Day 7: A way to do it wrong! 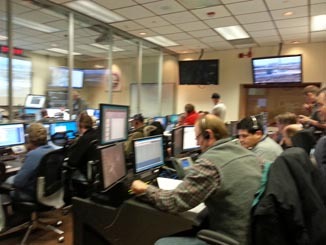 Members ofeach team in the Global Hawk Operation Center during IT test. Day 8 and 9: Sick Days! It is Wednesday, Jan 9th, exactly one weekworking at Dryden. The job has been going really well, but now,it is me who does not feel well. I took some time off to recover from a terriblepoison food. Being sick during my field work has been one of my worst experiences.I honestly tried to rest on my hotel room, but subconsciously, I was stillthinking about how things were going in the hangar. Fortunately, things wererunning smoothly and my team did not need me around. I bet interesting thingshappened at Dryden, but more excited things are about to happen! Day 10: Here is the plan! I came back to work today. I kept cleaningthe canisters (fortunately the last set), but the most interesting part of theday was our first Science meeting. 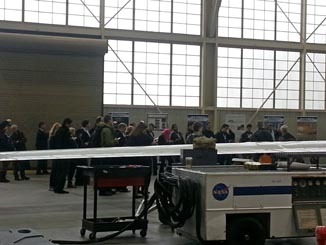 Around 1: 00 pm all the scientists met withthe Principal Investigators (Eric Jensen and Lenny Pfister)to talk about flight plans, science targets and meteorological issues. Itseems like the flight strategies are pretty clear, and the weather seems tocooperate for the flight proposed for next week. 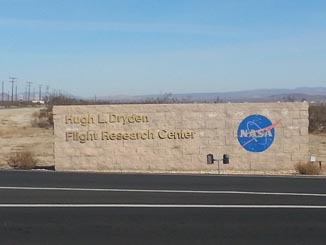 Let’s just hope we can completeall the combine system tests on time, thus we can be ready for our first scienceflight!! 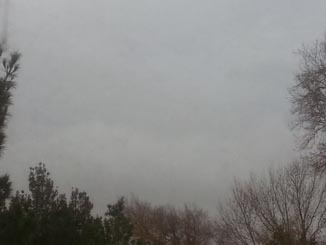 !, and let me enjoy the weekend, which weather seem to be prettyawesome too!!! DAY 13: CST,PRE-CST, PRE2 CST…which one is it? Well, to be honest, today I felt like I wasin an operating room, but outside…in the waiting area. We started our morningready for a CST (combine system test), a communication test that involved thescience teams and the aircraft pilots. 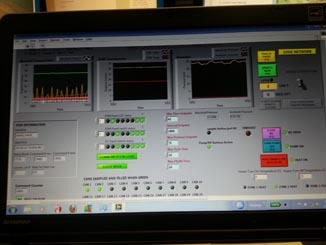 Unfortunately, the Ku- band system failed for almost half of the day and we did not have any other option thanwait until it was fixed…Yes, these things happens and it is no one fault…forthis reason you should always be prepare and expect the unexpected during fieldwork. Around 3:00 pm Ku-band became operative.However, the CST turned into a PRE-CST (the same exercise but w/o pilots) asthe pilots were not available at the moment. 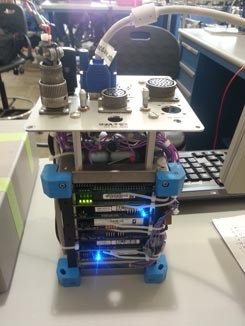 The bright side of this test was the successful result of ourinstrument. We were finally able to communicate through both bands KU andIridium. Welcome to my blog and to my amazing journey on ATTREX 2013. I feel excited aboutthis new campaign, even though it happens immediately after my New Year’s partyand I haven’t had enough time to rest! Today, I flew from Miami, FL to Los Angeles, CA on a long 5hours flight. During this time, I have not only watched movies, solvedcrosswords, and listened to some music; I also thought about my expectations forthis campaign. As a scientist, I have aninfinite number of goals. For example, I would like to develop my research skills,and/or to improve my performance using the basic knowledge I acquired lastyear. But as a member of the ATTREX team, I only hope for the fieldwork to runsmoothly. The problem is that there are some things you simply can’t plan for during a field work, and unforeseen problemswill definitely change our mission plans. In this context, I believe that myonly option is to be optimistic and to think positive! Since graduate school I learned that obstaclesare the stimulus that impels our actions to successfully complete our work, andI am sure that ATTREX 2013 won’t be the exception to this rule. Thus, welcometo this adventure and to the new challenge that is waiting for us. Today was my first day at Dryden. It was nice to come backand see all the familiar faces and wish them Happy New Year. Our day started pretty early in the morning (around 6: 00am). I was still tired from my trip, but I like to get my hands on theaircraft, so I wouldn’t miss it for the world! 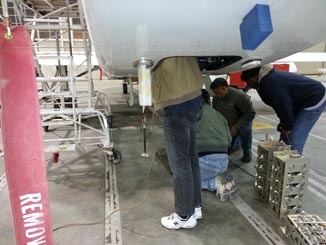 Our job today was to install ourinstrument inside of the aircraft to complete the weight and balance. However,since it was the first installation for the mission, Elliot (our instrument PI)took charge. I then played the role of assistant, which it is not that bad…atleast I was still able to touch the aircraft (literally). Thus, as an assistantI was just handled the modules and the necessary tools for the AWASinstallation. The problem was that I wasn’t too familiar with the name of thetools in English (oops!). Luckily, our brilliant mechanic Steve was nearby, andhe handled most of the tools for me…Thank you Steve, you certainly avoided my awkward moment. Despite this embarrassingmoment (that I think nobody knew until I wrote it), I still feel proud of mylabor! Today I’m not just a simple chemist; I’m a chemist who knows the name ofthe tools. That’s the beauty of ATTREX,there is always something new to learn!! I finishedmy week and started the new one by cleaning canisters!!! This is definitely oneof the most important steps to assure the precision of our work. Thus, I haveto be really careful about the procedure and keep track of all the steps. Theprocedure is very simple, although sometimes it takes a couple of hours to bedone. Basically, I introduce the canisters inside an oven and pump out the airthat was previously setting inside them. Then, I introduce clean nitrogen andpump it out again. I repeat this process several times, so it keeps me busy formost of the day. However, one of the greatest advantages of doing this work isto be close to the oven. To be honest, the temperatures in the desert have beenextreme! !, and I think the hangar has a peculiar temperature regulator… It canonly be set to cold or “super “cold. So, if you are planning a trip to Drydenduring winter time, just be sure to bring extra coats or your own oven!!! I am a postdoctoral associate from the University of Miami. 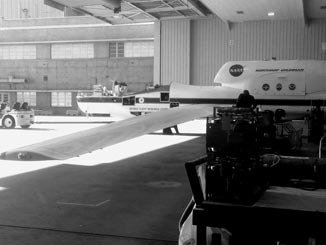 During year and a half, I haveworked in the ATTREX project as a team member of the Advanced Whole Air Sampler(AWAS) for the Global Hawk aircraft. My main role is to help with the sampling, analysis, and data interpretation of tracegases collected by our instrument. My educational background includes a BS inChemistry from the Central University of Venezuela, and a PhD in EnvironmentalScience from Indiana University. 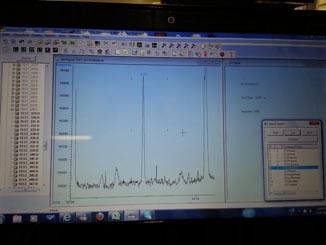 Myprevious work experience involves atmospheric chemistry research of differentlevels of the atmosphere, focusing on the analysis of particles and gases. The purpose of my blog about ATTREX is to share myperspective about this experience, and I hope thatmy writing will be engaging for those people who might think of science assomething too abstract and complicated. Science can alsobe fun! Check out this video if you want to know a little bit more about me.